Chinch bugs are very small, parasitic insects that feed off of and eventually kill plant life. If action isn’t taken, they can cause a lot of damage to a lawn. However, the damage can be minimized when chinch bugs are managed properly. The chinch bug is considered a major insect pest on home laws. Lawns that are attacked by chinch bugs looks like grass suffering from drought. This will resemble brown patches in your lawn and along your driveway and sidewalks. If you are not sure what damaged your lawn, you may want to call a professional. 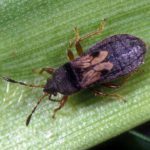 Chinch bug infestations frequently occur in drought-stressed turfgrass with thick thatch that is exposed to full sunlight during periods of hot, dry weather. Damaged areas in the beginning look like small, irregular patches. This will eventually spread into large patches of dead, brown grass as the insects spread. The initial damage typically starts along driveways and sidewalks. Chinch bug infestations frequently go unnoticed because they are small and their color blends into grass and thatch. Damage frequently occurs from June through September during hot weather when the insects are actively feeding.